Welcome to NewYork-Presbyterian/Weill Cornell Medical Center. Here you will find a staff dedicated to always providing the highest quality, most compassionate care and service to each and every one of our patients and their families in a warm and friendly environment. 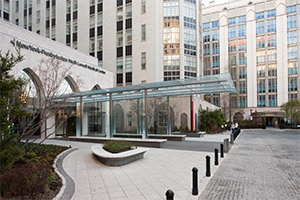 NewYork-Presbyterian/Weill Cornell Medical Center is part of NewYork-Presbyterian, one of the nation’s most comprehensive academic health care delivery systems, dedicated to providing the highest quality, most compassionate care to patients in the New York metropolitan area and throughout the globe. In collaboration with two renowned medical schools, Weill Cornell Medicine and Columbia University College of Physicians & Surgeons, NewYork-Presbyterian is consistently recognized as a leader in medical education, ground-breaking research and innovative, patient-centered clinical care. Cross Town: Take the M31 to the East 69th Street stop, directly in front of NewYork-Presbyterian/Weill Cornell. The M31 operates north and south on York Avenue, and across town on 57th Street. Cross-town buses M30, M66, and M72 allow you to transfer to the M31 at York Avenue. Uptown and Downtown: You may also take the M15 bus which travels uptown along 1st Avenue and downtown on 2nd Avenue. Exit at 68th Street. Either transfer to the M66 line eastbound to York Avenue and 68th Street, or walk 1 or 2 blocks east to the hospital. From Port Authority Terminal: Take the #10 bus on Eighth Avenue going uptown. Get off at 65th Street. Transfer to the #66 bus going east. Get off at 68th Street and York Avenue. Approaching from South of East 68th Street - Take the FDR Drive northbound to the 61st Street exit. Make right onto York Avenue and go north to 68th Street. Approaching from North of East 68th Street - Take the FDR Drive southbound to the 71st Street exit. Make left onto York Avenue and go south to 68th Street. From New Jersey: Take the George Washington Bridge (lower level) to the Harlem River Drive. Then take the FDR Drive south and exit at 71st Street. Turn right on 71st Street. Go one block and turn left onto York Avenue.